The gun was an odd-ball – a Smith & Wesson Model 60 with a 3″ barrel. You can walk into just about any gun shop and find some kind of holster for the standard 2 1/8″ barrel J-frames, but for a 3-incher? Forget it. And further, I had a particular set of specifications in mind for this holster: an IWB, an “ear,” straps for a 1 ¼” belt with brass snaps rather than screws, all leather with no plastic, and a steel-reinforced mouth to stay open for easy re-holstering. I did a lot of surfing and found offerings from a number of leather makers, but none had all of the features I wanted for the gun I had in mind. I remembered an article I had read about Rudy Lozano of Black Hills Leather. I went to his web site, and found a holster that was very close to what I wanted, the BH76. I called Rudy and told him what I wanted and asked him if he would build it. Rudy answered that not only would he build the holster, but that I would receive a holster of exceptional quality and he personally guaranteed my 100% satisfaction. There was a confidence in his voice that told me this wasn’t empty bravado. I wasn’t disappointed. The holster was delivered in about four weeks. I called Rudy when the holster hadn’t arrived in three weeks, and he explained that there had been unusually wet weather in Laredo (hurricane season in the Gulf) and it had slowed the curing process in the leather. I was willing to wait but it was hard. It’s cool to know that I have a unique creation from a master craftsman. I doubt that he gets a multitude of orders for IWB’s for 3″ Model 60’s. But in doing so, I got a holster built exactly to my specs for my odd-ball gun. The holster is substantial and solid with a chestnut brown finish and brass strap snaps. 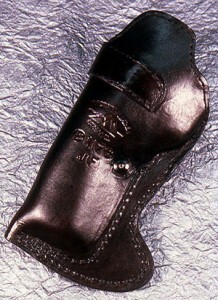 The leather on the main body of the holster is 1/8″ thick. The holster is also lined. It has a tensioning screw just beyond the point that you would find if you drew intersecting lines from the front of the frame and the top of the trigger guard. The trigger is completely shielded, and the “ear,” the flange of leather extending up from the mouth between the gun and your body, extends exactly to the point where the grip begins so that no metal can touch your body. With this gun, that means the cylinder latch is shielded from digging into your skin. Black Hill’s specialty is cowboy leather, and this holster retains a bit of that ambience. Like western holsters, this one is not excessively boned and molded to every little contour of the gun. It is smooth. Of course, this is preferable for a holster that spends its life inside your pants. A lot of molding on an IWB would just create pressure and abrasion points. 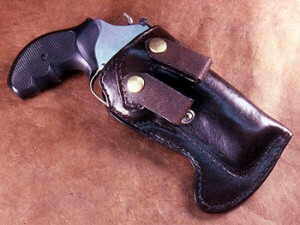 This is a solid holster that is capable of standing up to extended heavy duty. It’s a bit heavy compared to some of my other IWB holsters, but that doesn’t bother me. The weight comes from the solid construction, and so far it has proven to be a very comfortable holster to wear. In my opinion, IWB’s aren’t really “comfortable” compared to “outside-the-waistband” belt holsters, but among the IWB’s that I have tried this one is the most comfortable and stable. It doesn’t shift or rock around. Some of this has to do with the fact that most IWB’s with belt straps are built for 1½” belts and I wear 1¼” belts, so I had this one built to a 1¼” belt. Having the straps fit to the belts you actually wear makes the holster much steadier. I’m sure the “toe” flange aids in stability also. This holster stays where you put it, even after repeated standing up and sitting, getting in an out of the car, and bending over. It’s a no-nonsense holster with just a touch of cowboy flavor that fits the gun like a glove. I like it, and I like Rudy Lozano. He’s a real gentleman and a pleasure to deal with.